“Edamame” is a Japanese word meaning green soy beans, but I feel it seems to be a common word in the world when I am looking some web sites. 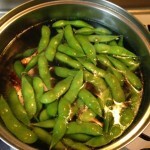 I have already written an article how to boil Edamame. However to boil is most common cooking method for Edamame, there are more methods. Today, I would like to introduce Edamame Rice. It’s easy to cook, just steam rice with edamame. This style’s steamed rice is called “Takikomi Gohan.” which steam rice with some ingredients together, and there are many different type. “Taimeshi (Sea Bream / Snapper Rice)” or “Takenoko Gohan (Bamboo Shoot Rice)” which I wrote before are one type of it. I like this kind of rice and will introduce more in the future. 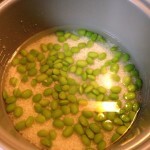 1) Wash Edamame with water and boil it for about 1 min. This step is almost same with to boil Edamame, but no need any salt when washing and boiling. The time is shorter than regular boiled Edamame, so it is a little harder. 2) Wash Rice with water. Place in a pan and put same amount of water. This step is completely same with to make steamed rice. 3) Pick out Edamame Beans. Place them on the rice. Add Sea Salt and Stir. 4) Steam the rice as same as to make regular steamed rice. 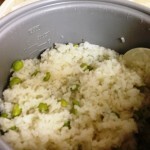 5) When it has been steamed, stir rice and edamame. Serve it with Chawan (smaller bowl). I boiled Edamame a little because it makes me to pick out beans easily. If you don’t mind easy or not, you don’t need to boil. I used steam cooker at this time because it is very easy (but takes longer). But if you don’t have it, you can cook with a pan and stove. 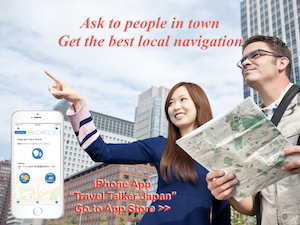 Please refer this page how to do. 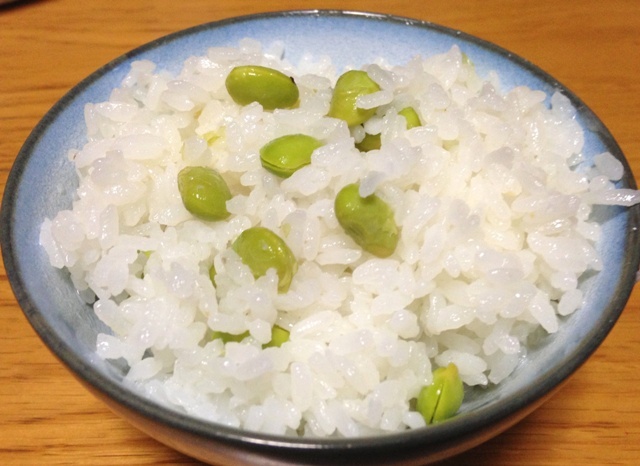 To make Edamame Rice easily, you can make boiled Edamame and steamed rice separately, then stir them together. But I think this method wrote as above will bring much better taste. Usually, Edamamae is boiled with salt. So it tastes a little salty. But with this recipe, beans are not boiled with salt. So the taste is little sweet which the edamame bean originally has. When I ate this Edamame Rice, I remembered Chestnuts Rice. It’s a kind of Takikomi Gohan, and seasonal food in autumn. Edamamae seems to be eaten since Nara era (710 – 794) or Heian (794 – 1185) era in Japan. It has very long history. As you might know, Edamame is young soy beans. It is completely same plant, but it is said that kinds which is good for Edamame or Soy beans are different. Also there are some different brands of Edamame such as Dadachamame or Kuro Edamame in Japan. Especially, Kuro Edamame is well known as the one of highest kinds. Tamba Sasayama in Hyogo Prefecture (west Japan, next to Osaka) is its home place. “Kuro” means black in Japanese. It is young stage of black soy beans which tastes very sweet. 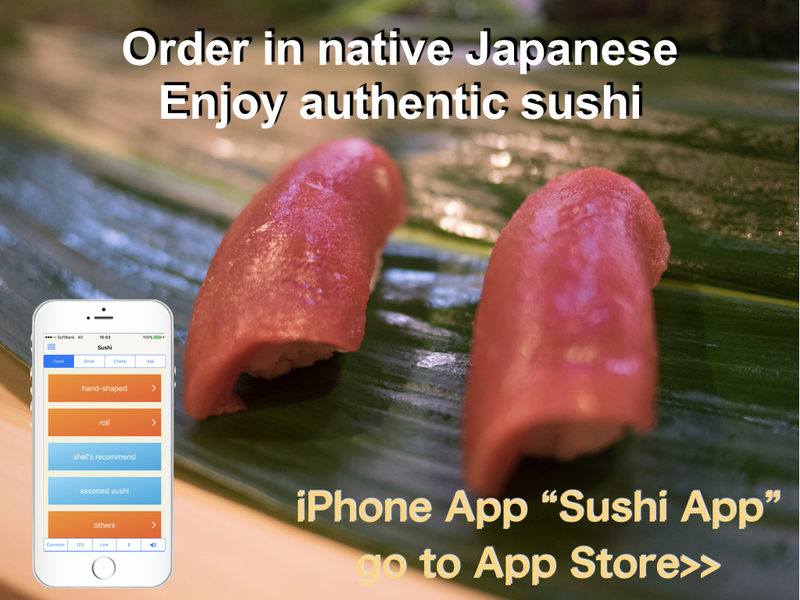 If you have a chance to eat several brands of Edamame, it is worth to try. Thank you very much for your comment, Charabi.